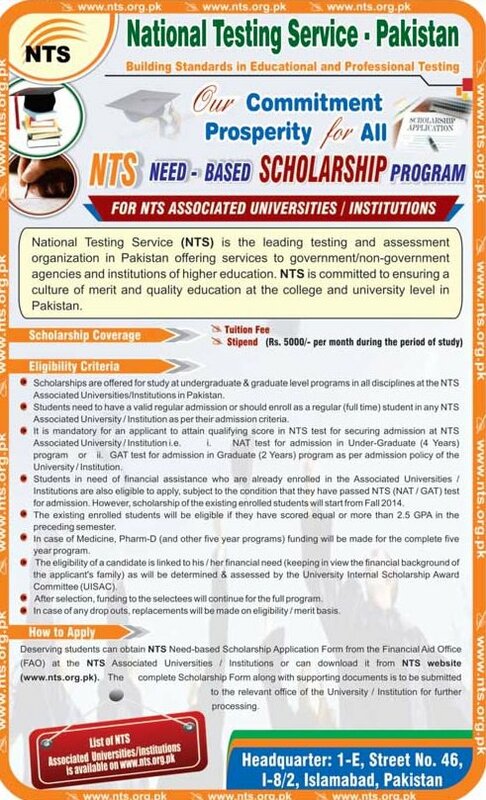 NTS Need - based Scholarship program has successfully accomplished its 1st phase in all associated universities / institutions. And now NTS is announcing the 2nd Phase of NTS Need - based Scholarship Program under Corporate Social Responsibility in order to financially strengthen the deserving students by covering tuition fee along with the amount of stipend. NTS recompenses the complete or partial tuition fee of the nominated student enrolled in under-graduate / graduate level program of the NTS Associated University or Institution. Every nominated student as selected by the UISAC is also eligible for stipend amounting unto Rs. 25,000/- per semester or 5,000 / per month. Qualifying scores in NTS tests for securing admission at a NTS Associated University / Institution i.e. NAT test for admission in Under-Graduate (4 Years) program. GAT test for admission in Graduate (2 Years) program as per admission policy of the University / Institution. The existing enrolled students will be eligible if they have scored equal or more than 2.5 GPA in the proceeding semester. Students need to have a valid regular admission or should enroll as a regular (full time) student in any NTS Associated University / Institution as per their admission criteria. After selection, funding to the selectees will continue for the full program. You have established that deficiencies of weaken understudies heart them a fantastic game plan when they see physically solid and sound understudies in http://www.bibhelper.net/professional-annotated-bibliography-writing-services/ zone. I think, by giving the correct direction to hurt understudies can make them chipper that is profitable for them and for their dears as well. Such scholarship programs are really best for students and this is only possible when we need to go this site https://www.personalstatementwriter.com/how-to-answer-why-kellogg-mba-essay-prompt/. These graduate progarms are really best. Scholarship programs are always best for students and this site https://www.phdresearch.net/phd-proposal-writing/ provides us more idea to learn about such plans. Also we can see these details in official page. Fantastic article information. Scholarship is best process for students to achieve financial and educational help. This is absolutely very good post about scholarship program for Pakistani students. This information should helpful for students to apply for this scholarship program. Also you should visit at https://www.summarizing.biz/teaching-summary-writing to get summary writing help services. Thanks for sharing good scholarship news.